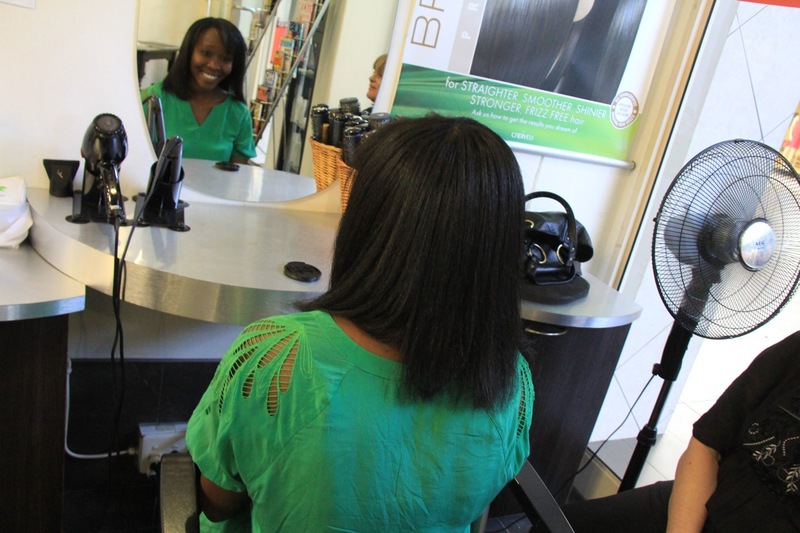 So I went to the Share salon in Campus Square in Johannesburg, Gauteng, South Africa. A very nice “colored” lady (still so weird to use that word) here did my hair, her name is Fiona. I had a 10:30am appointment and was worried about getting to meet my friends for plans at noon, but Fiona said she should be done just after 12. Heads up: This was TIME CONSUMING! When she’d said it would only take an hour and a half something about that math wasn’t making sense, but I thought “what the hey, I’ve really been struggling with my hair and need to figure something out,” so I proceeded. Step 1, Cleanse) Fiona washed my hair with a special cleansing shampoo to strip out any build-up. Step 2, Apply) I went onto a chair out on the floor where Fiona and another woman put on gloves and used applicator brushes to begin applying the keratin treatment to my hair and combing it through individual sections. The treatment did tingle on one section of my scalp, but never burned (after years of relaxers, I could appreciate that). My only complaint so far was that I felt they could have been more gentle with the combing, it felt like some of my hair was ripping off! Step 3, Dry) Next, Fiona blowdried my hair. I was concerned because the blowdry was without a comb or brush, which normally leaves my hair really hard! This was no different. So far, I was worried. Fiona had warned me the fumes might be bad, which was confusing, as this treatment supposedly doesn’t have formaldehyde in it (a big concern for me). Sure enough, at one point my eyes and nose did get a bit irritated, but that was very short-lived and not as major as I’ve heard it is with other products. I think the experience is much worse for the hairdresser, as poor Fiona was tearing up at this point. Step 4, flat-iron) Fiona made small sections and ironed each piece a few times. She wanted to get as close to the root as possible, but sometimes it hurt! Overall, it was a painless process. Well physically painless, but time? PAINSTAKINGLY SLOW! Note: she did this at 350 degrees, not the 400 I’d read is standard. I was concerned, but she said it was fine and that each product is different. Note: At this point, I was NOT impressed! My hair was straight after the flat-iron, but felt really coarse, not at all smooth. Step 5, condition) Once she finished she rinsed my hair, used the conditioner that comes with the system, and then put another deep conditioning treatment on my hair and had me sit under the dryer for quite some time. I didn’t mind because I wanted to make sure my hair got softer, like I said, at this point I was not impressed! After the wash I did notice my curl was a LOT looser, almost disturbingly so. Aside from the occasional ringlet, it looked wavy, NOT CURLY. Kind of like a body wave. I think they were surprised when I asked if some of the curl would come back, because the lady who washed my hair told me quite triumphantly that they probably wouldn’t. Hm. Maybe it’ll revert a bit after I wash it. Step 6, Blow-Out) Fiona blow-dried my hair with a round brush and it took WAY less time than it normally does, which is what I wanted, so that was a good sign. 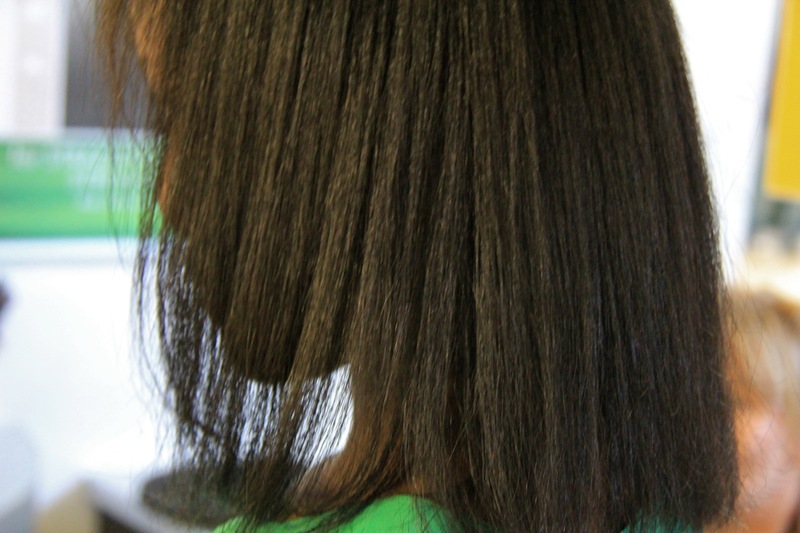 She then flat-ironed it and even trimmed the ends, which was nice of her. During this process, her white coworkers kept coming over saying how nice and soft it was, with things like “can you believe your hair? ?” “it’s so nice!” “did you ever think you’d get it this straight?” I didn’t want to hurt anyone’s feelings, but I finally did say “well my hair gets this straight when my hairdresser does it at home,” and one woman replied “yes but the drying time is less,” and she was absolutely right. 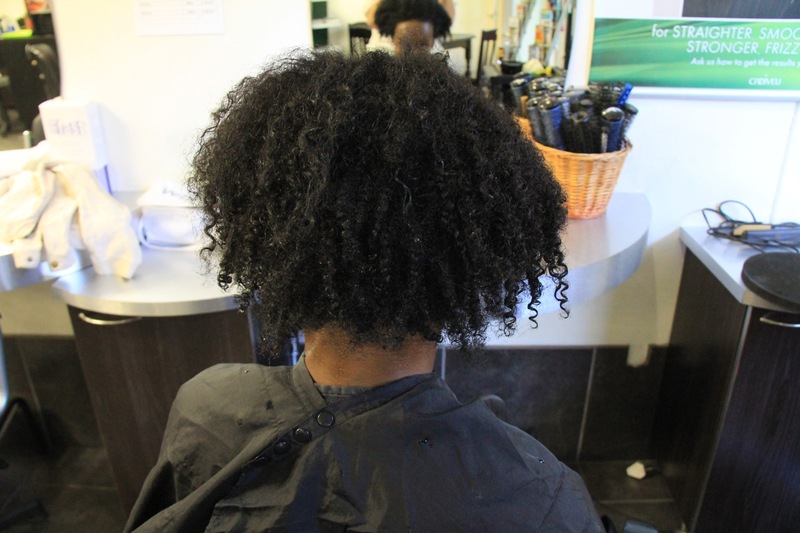 I was getting a bit bothered by all this anti-curl talk, but I guess people expect you to want to get rid of them if you come in for that kind of treatment! The lady who washed my hair even went “where are your curls now! ?” again, a bit too triumphantly. In light of all the congratulations at getting rid of my God-given curl, I felt the need to defend my guys and went, “well I hope some comes back!” The lady said “you love your curls?” and unable to hold it in anymore I said-probably with a bit too much conviction-“Yes I do!” Wow, kind of like the overwhelming need to defend your annoying little brother when somebody else talks mess about him. Verdict: So far, so good. In the end my hair was straight, shiny, and did move. My hair feels a bit thicker and stronger, which is nice, but it’s a bit ironic it doesn’t feel as silky as it normally does with a natural salon blow-out at home, but maybe that’s because the keratin bulks up the hair shaft. I am curious to see how it is when I wash it myself. I need to make sure to find a sulfate-free shampoo, as they say shampoos with sulfates will strip the product from your hair faster. “I saw your hair when you came in…and then it got wet, I couldn’t believe it…I know you told me.” Yes I did! LOL! Well good on you for sticking it out, Fiona! Final note: I don’t understand too much of this “curl pattern” talk, but if I had to describe it, my hair is somewhere between a 3c and a 4a. It is very fine and when it is wet, there are a lot of corkscrews at the ends, though much of it is really spongey in sections, not separated curls. I think this is important to mention because I don’t think the BKT may give the same on all black hair types (for example I wonder what would happen with hair people describe as “cottony”) and I’d hate for anyone to waste their money! If you want your hair really really straight this is probably not for you. 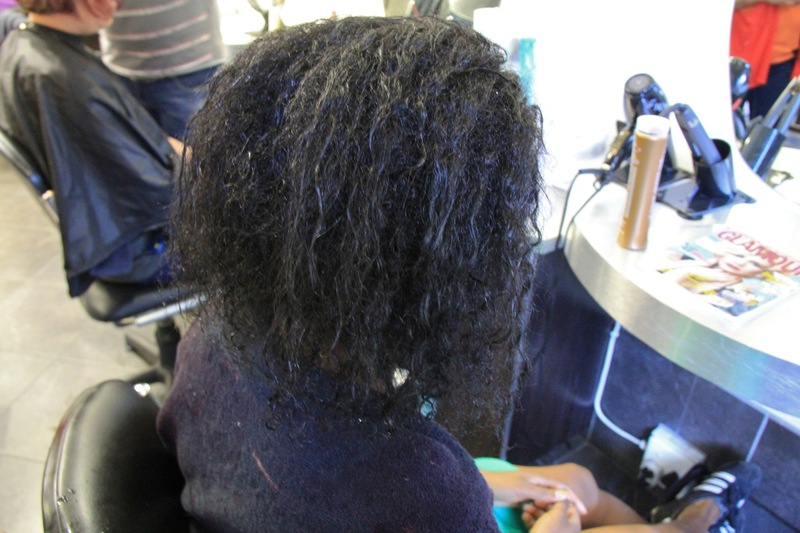 Some people say that a few weeks after doing the Keratin Treatment, you start to experience breakage from all that heat that was used. Was that the case with you? I’m really considering giving it a try. A bit of breakage, but mostly, my hair just felt brittle! Not soft like before the treatment.